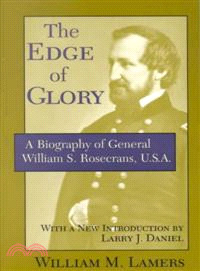 Major General William S. Rosecrans (1819–1898) was one of the most fascinating and tragic figures of the Civil War. In September 1863 President Lincoln and Congress considered him the most able general on the Union side, but only one month later “Old Rosy” was removed from his command and then quickly forgotten. With The Edge of Glory, William M. Lamers returns this imposing, colorful figure to his rightful place in history. William M. Lamers was the assistant superintendent of schools in Milwaukee. Larry J. Daniel, a Methodist minister in Murray, Kentucky, is the author or coauthor of three books on the Civil War, including Shiloh.